The software is capable of converting entire data of NSF file to EMLx format, including folders, contact, task, calendar, etc. The software supports all editions of Lotus Notes file and convert its data effortlessly. User can check the preview of the conversion process at the real time. Various filter options are present in this tool to attain selective migration of data. The utility is supportive to Windows OS and it could be installed on any edition of Windows machine. The software is supported by simple and easy interface, which make it a user friendly tool. 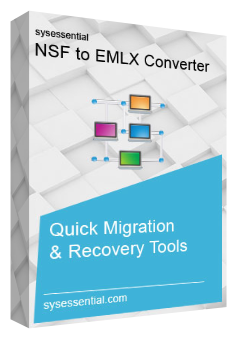 Some more attractive features of NSF to EMLx Converter are here! The Sysessential for NSF to EMLX utility allow users to save the converted resultant file in different ways. You can save the file at desired location on your machine with multiple file naming options such as date, name, sender and location. The resultant file could be accessed directly from the saved location. To measure the proficiency and the reliability of this software, free version of software is there. It gives complete knowledge of the software working. The software free version allows users to convert 25 items in each folder. Once the software has converted .nsf file to EMLX format, you can access the new file directly. There is no requirement of any other supported mail client. The software has two options for importing the .nsf file, whose data need to be converted. First, option lets the users to select the .nsf file present in the machine, and the second option asks the users to locate the folder in which .nsf file is saved. In the second option, the wizard will pick the .nsf file itself. The software is compatible with all editions of Windows OS and Lotus Notes. It can be installed on any Window machine and file of any NSF edition can be uploaded on it to convert it to EMLX format. You can do the screening of the data conversion process checking the preview option. This helps in making any correction meanwhile. While converting the data of NSF to EMLX format, software ensure conversion of meta information as well and the good thing is that, meta properties of email does not change. All the information remains in the same format. The Meta information include To, CC, Bcc, From, Subject, Attachments, etc. The SysEssential for NSF to EMLX convert software, is the most efficient tool, which is willing to convert entire data of Lotus Notes NSF file to EMLX format. It converts the data like inbox, default folders, created folders, tasks, contacts, calendar and other items. While, converting the format of a file, the software ensures that no data is lost and alteration done in the original format of the NSF file. What is the size limit of Lotus Notes file which could be converted? There is no limit to the file size, the software is capable of converting any size of Notes file to EMLX format easily. It also supports bulk and batch data conversion. What will happen to attachment present in emails? The Sysessential for NSF to EMLX convert software is capable of converting all types of data of NSF file to EMLX format. The data include inbox, sent items, calendar, contact folder, attachments, subject, date and time of email, task and other information. How can I convert multiple .nsf file to EMLX format? There are two licenses available for this wizard, the professional and home users. With the professional version of the software, you are allowed to import multiple .nsf file in the software and convert its data to EMLX format and also save it desired location. The professional version of the software could be uploaded on multiple machines and data could be converted. Does the software require the Lotus Notes environment to complete the conversion process? Yes, to convert .nsf file to EMLx format, the Sysessential for NSF to EMLX utility require the Notes environment. However, the resultant and the saved EMLX file could be accessed directly. Any edition of Notes could be installed on the machine to accomplish the data conversion. Where can I find the assistance, if stuck with any issue? The assistance pertaining to working of software is available round the clock for users. It is offered by the technical support team of Sysessential. You can get in touch with the team to get all types of help. My experience of converting NSF file to EMLX with the help of Sysessential for NSF to EMLX is excellent so far. It has all the qualities that one wants in a conversion software, quick conversion, complete conversion and no data loss. It is complete flawless. 2. I was facing trouble working with IBN Lotus Notes email client and decided to switch to some other mail client, but data migration was the biggest trouble. Then I took the help of Sysessential for NSF to EMLX. The results were unexplainable fantastic. It seems like software has created the replica of NSF file in EMLX format. All my data were converted EMLX format and software also allowed me to save the file at my desired location. This is really a wonderful tool.